2,175 miles from Georgia to Maine. 120 miles in the Roanoke Region. The Appalachian Trail follows the Appalachian Mountains from Georgia to Maine and offers dozens of short and long hikes, easy to strenuous in the Roanoke Region. Enjoy trail loops that peak at waterfalls and cliffs, promising spectacular views. The trail is perfect for day or overnight hikes and backpacking trips. Shelters, which are typically three-sided structures that allow you to camp without a tent, are spread along the trail at varied intervals which allow you to hike at your own pace. This interactive Appalachian Trail map shows shelters, parking lots, and vistas along the A.T. 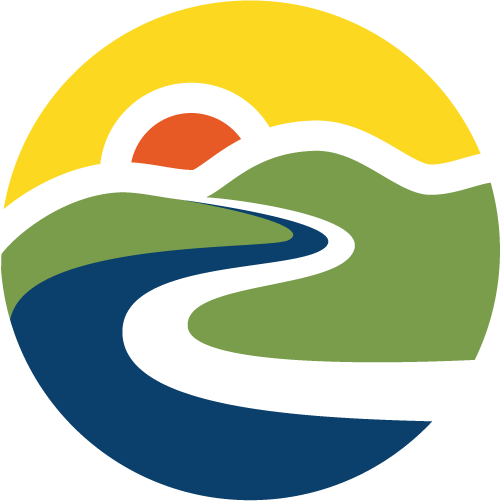 Learn more about the trail and how to get involved with conservation efforts from the Roanoke Appalachian Trail Club. The climb to Angel’s Rest above Pearisburg is notorious among Appalachian Trail hikers for its punishing incline. You must endure a 1.5-mile, 1,650-ft. climb before you can sprawl over a boulder enjoying the view of the New River. The hike is 4.6 miles round trip. The well-worn trail leads into a spring-fed ravine and briefly along an old logging road before settling into a consistent, thrashing course of switchbacks. The path crosses over two ancient rockslides and passes through thick poplar and oaks, as well as laurel and rhododendron. Gradually, the thriving hardwood forest of the lowlands gives way to stunted oaks and shrubs. When you reach the boulders at the top, detour a few hundred feet to the right on a blue-blazed trail for a view of Pearisburg and the twisting New River. The A.T. continues to the crest of Angel’s Rest and follows along a rock ledge overhanging Wilburn Valley for spectacular views. 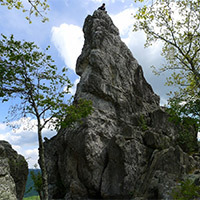 Dragon’s Tooth is a unique geologic feature that consists of Tuscarora quartzite spires which outcrop on the top of Cove Mountain. The tallest “tooth” projects roughly 35 feet above the surrounding rock. The trail to Dragon’s Tooth ascends steep, rugged outcrops of quartzite which form the spine of Cove Mountain and North Mountain. The spine is known as Dragon’s Back. 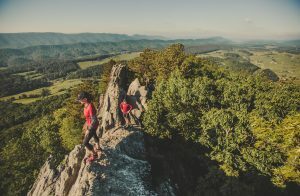 Note: The Dragon’s Tooth hike is one of the most popular hikes along the entire Appalachian Trail and sees a tremendous amount of hiker traffic. It is ideal to hike this on a weekday as weekends are very crowded. Vehicles not parked in the parking lot are subject to tow. Please read specific rules and regulations at the bottom of this description. ~ 4.5 mile round trip, out and back hike. 20 minutes from downtown Roanoke. Map kiosk at trailhead (very straight forward hike). Take a picture of the map so you have it on your phone. The trail starts with a kiosk at the back of the parking lot. You will follow the blue-blazed trail to the very top. Go 0.25 mile and cross two small bridges. You’ll see the intersecting yellow-blazed Boy Scout Connector Trail. Bear right and continue on the blue-blazed trail. Continue for nearly 1.5 miles, crossing the creek several times on a steady incline before reaching the Appalachian Trail intersection. Turn right to go south on the white-blazed Appalachian Trail. 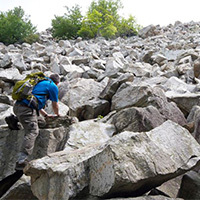 There will be 0.7 miles of steep rock steps before bearing left at the intersection to follow the blue-blazed trail to Dragon’s Tooth. Come back the way you went up, or once you reach the Appalachian Trail, go beyond the blue-blazed trail you started on and continue north on the A.T. until you reach the yellow-blazed Boy Scout Connector Trail. You’ll go left on this trail until you reach the blue-blazed Dragon’s Tooth Spur Trail, and go right toward the parking lot. This second route back offers different scenic views. From Roanoke – take I-81 south to Exit 141. Turn left at the traffic light onto Rt. 419 (Electric Rd.) and follow 0.4 miles to next traffic light (Rt. 311). Turn right onto Rt. 311N and follow for 10 miles. Dragon’s Tooth parking lot is on left just past Catawba Grocery. Max. group size for day hikes is 25 people. Max. group size for backpacking/camping is 10 people. No camping or campfires outside of the 7 designated shelters/camping areas. Visit local A.T. C. Club for more details. Finish your day with a great meal at the Home Place – a restaurant famous among thru hikers. To reach the Home Place, continue north on Rt. 311 for ~1 mile to a large white farmhouse on left. Grab a beer at Parkway Brewing Co.
A 6.6 mile, out and back hike on the Appalachian Trail, Kelly Knob is located on a ridge that bridges the valley between John’s Creek Mountain and Clover Hollow Mountain and is immediately off of the Appalachian Trail. While Kelly Knob is not the highest point on the ridgelet (the high point is densely wooded), it is still much higher than its mountain neighbors with a fantastic vista of the New River Valley. A shorter option (4 miles round trip) approaches Kelly Knob from the opposite direction. Sandstone bedrock forms a broken escarpment along the east and south of the ridge, and the area around Kelly Knob is particularly striking with 50 foot cliffs containing deep fissures in the rock. 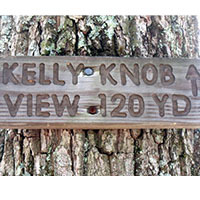 The trails to Kelly Knob are well signed and traveled. McAfee Knob is the most photographed site along the Appalachian Trail. 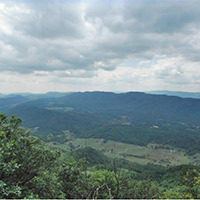 The knob has an almost 270-degree panorama view of the Catawba Valley and North Mountain to the west, Tinker Cliffs to the north and the Roanoke Valley to the east. 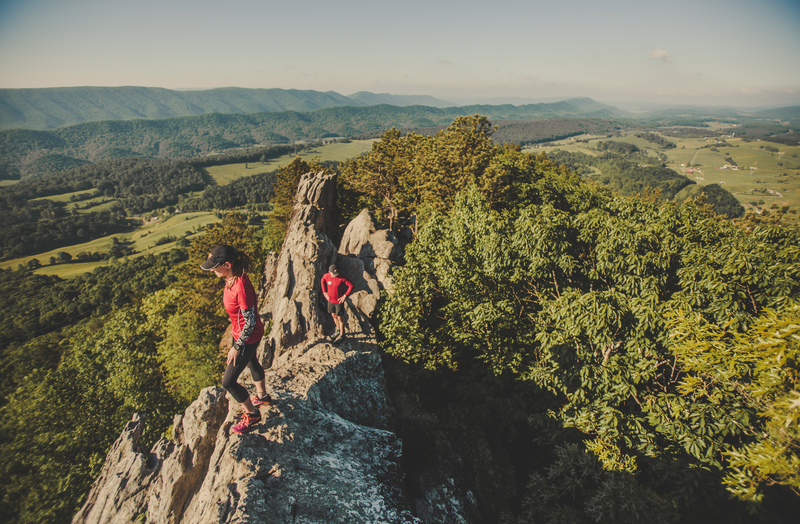 Note: The McAfee Knob hike is one of the most popular hikes along the entire Appalachian Trail and sees a tremendous amount of hiker traffic. It is ideal to hike this on a weekday as weekends are very crowded. Vehicles not parked in the parking lot are subject to tow. Please read specific rules and regulations. Approximately 7.5 miles round trip. Trail begins on the opposite side of Rt. 311 from the parking lot. Cross Rt.311 with caution. You will travel north on the Appalachian Trail (AT) on to McAfee Knob. Follow the white blazes – which are 6” rectangular paint marks placed periodically on trees at eye level. After ~0.3 miles you will come to an informational kiosk. You will cross four wooden walkways prior to reaching the Johns Spring shelter. You will then cross five more wooden walkways before reaching the Catawba Mountain shelter. Next you will cross an old fire road and a power line clearing. Continue 0.5 miles further and turn left onto the McAfee Knob spur trail to arrive at the lookout in ~30 yards. Retrace your steps or turn right once you reach the alternate fire road for your return trip. The Mountain Lake Conservancy manages 2,600 acres of mountainous terrain that encompasses a unique ecosystem due to an average elevation of more than 4,000 feet. More than 20 miles of fern-lined trails on the property are open to the public for biking year-round. The trails are home to the “Dirty Dawg MTB Race” and offer trail options for all experience levels. Mountain bike rentals are available at Mountain Lake Hotel. The 6.6-mile out and back hike on the Andy Layne Trail intersects with the Appalachian Trail and ends with incredible views. 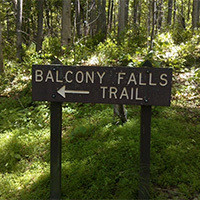 From the trailhead, take the yellow-blazed trail for about 3.1 miles to the intersection with the Appalachian Trail. Turn right onto the white-blazed A.T. (southbound) and reach Tinker Cliffs within 0.75 miles. Enjoy the 180 degree view. From 1,300 feet near the trailhead and creek crossings to just a hair under 3,000 feet at the cliffs. Bluff top views are the most prominent feature, but there are also nice creek drainages, intriguing rock formations, and lovely forests on the way. Even the part of the trail that goes through a cow pasture includes pleasant rushing streams and scenic views up toward surrounding ridges. Some tough, steep stretches as it rises 1,700 feet in elevation. 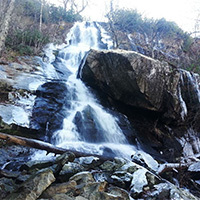 Tinker Ridge Trail crosses Tinker Creek, which is the site depicted in Annie Dillard’s “Pilgrim at Tinker Creek,” then ascends Tinker Ridge at Hay Rock Overloook, providing spectacular views of Carvins Cove and the Roanoke Valley. The 8-mile round trip hike on the Appalachian Trail is just 15 minutes from Downtown Roanoke and is of moderate difficulty. 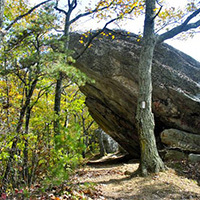 The Triple Crown is a combination of three amazing hiking destinations in Virginia. And they’re all conveniently located right around Roanoke. This overnight backpacking trip begins and ends at the Route 311 Appalachian Trail head. This is a difficult hike totaling about 32 miles. There are several options for hitting the Triple Crown. There are shuttle systems that will transport you from trailhead to trailhead. You can also take advantage of the Appalachian Trail and hike your way between the trails on the Virginia Triple Crown Loop. The conditions for backpacking are subject to change. 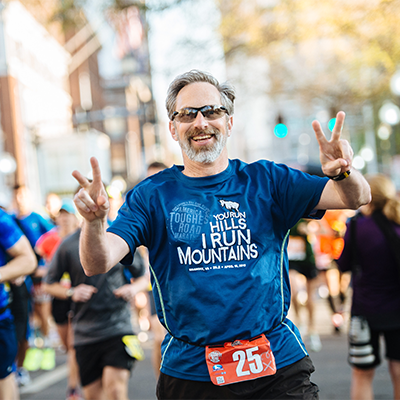 Stay updated before your trip and check in with the Roanoke Appalachian Trail Club. Up for the challenge? We broke it down for you. 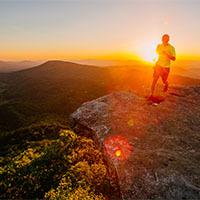 The most photographed site on the Appalachian Trail includes a nearly 270-degree panorama of Catawba Valley, Tinker Cliffs, and the Roanoke Valley. Breakdown: Beginning opposite of the parking lot off Route 311, you join the Appalachian Trail and head north toward the Knob. There’s an informational kiosk about 0.3 miles in. Follow the white blazes (rectangular paint marks on the trees) to stay on the right path. You’ll cross four wooden walkways and see the Johns Spring shelter. Then you’ll cross five more and pass the Catawba Mountain shelter. Next, cross an old fire road and power line clearing. Walk for another 0.5 mile and turn left on the McAfee Knob spur trail to arrive at the lookout. Come back the way you went up. Parking fills up quickly, and you can’t park on the shoulder of Route 311. Your best bet to guarantee parking is to visit on a weekday or before 8 a.m.
Another option for larger groups is to stop at the I-81 Exit 140 Park and Ride (click on the green car right by the ‘R’ in Roanoke on the map for directions) and carpool to the trailhead.This hike is lengthy and not to be underestimated, despite being considered the “easier” of the three Triple Crown hikes. Streams, creek drainages, rock formations, and lush forest offer pleasant views on the hike up, which rises 1,700 feet in elevation. Bluff top views at the peak with a 180-degree panoramic view are spectacular. Breakdown: You’ll start off of Catawba Road and follow the yellow-blazed Andy Layne Trail. You will cross two fence stiles, then two Catawba Creek bridges. Continue as trail bears left, then right after 100 feet. The hardest part of the hike includes a steep elevation gain with some areas of no switchbacks (zig-zagging). Three miles in, you will join the Appalachian Trail (white blazes). Continue and you will see a view of Broad Run Mountain. Next, you will reach a view of the Catawba Valley. The better view is 200 yards beyond this first view, with McAfee Knob clearly visible. Come back the way you went up. 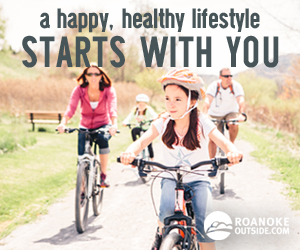 Stay on the trail – the area around the trail is private and belongs to Roanoke Cement Company. The trail gets steep in places, so be prepared. Explore the cliffs once you reach the top! Tuscarora quartzite spires that outcrop on the top of Cove Mountain are the distinguishing feature with the tallest “tooth” projecting about 35 feet above the surrounding “teeth.” The trail ascends the spine of Cove and North Mountain, called “Dragon’s Back” because it is composed of steep rock. Breakdown: The trail starts with a kiosk at the back of the parking lot. You will follow the blue-blazed trail to the top. Go 0.25 mile and cross two small bridges. You’ll see the intersecting yellow-blazed Boy Scout Connector Trail. Bear right and continue on the blue-blazed trail. Continue for nearly 1.5 miles, crossing the creek several times on a steady incline before reaching the Appalachian Trail intersection. Turn right to go south on the white-blazed Appalachian Trail. There will be 0.7 miles of steep rock steps before bearing left at the intersection to follow the blue-blazed trail to Dragon’s Tooth. Come back the way you went up, or once you reach the Appalachian Trail, go beyond the blue-blazed trail you started on and continue north on the A.T. until you reach the yellow-blazed Boy Scout Connector Trail. You’ll go left on this trail until you reach the blue-blazed Dragon’s Tooth Spur Trail, and go right toward the parking lot. This second route back offers different scenic views. Take a picture of the map at the kiosk, or bring your own. Despite new signs and a well-marked trail, people can still get lost on the way back down. 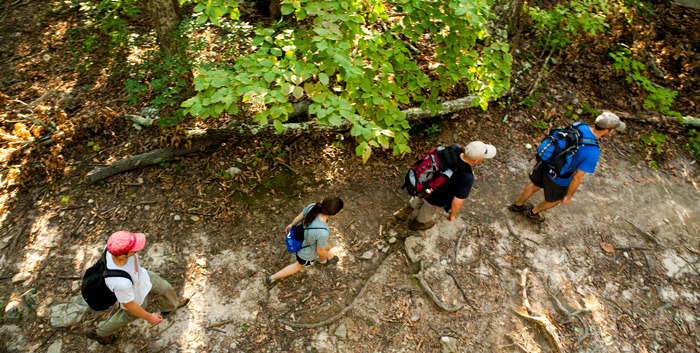 This hike is considered to be harder than McAfee Knob, and the last mile is very rugged, so conserve your energy. The parking lot here fills up quickly. The tips for McAfee Knob parking also apply. For added challenge, you can hike all three trails in one continuous backpacking adventure, since they’re all connected by the Appalachian Trail. Water: Stay hydrated! These hikes are challenging. At least one quart of water per person (2 on a hot day) is strongly recommended. If you’re bringing a four-legged friend, make sure there’s enough water for them as well. Snacks/lunch: You’re going to want a bite to eat at some point. Plus, a picnic at the peak of the trail is a great reason to stay longer to soak in the view! Camera: Snap a picture from the top so you can always remember the view. Supportive shoes: You’ll need sturdy shoes to venture up the mountains – especially the rocks at Dragon’s Tooth. Hat/sunglasses/sunscreen: Protect yourself from the sun. Rain jacket: In case of pop-up showers. Flashlight or head lamp, and warm layers: If the hike takes longer than expected and the sun starts going down, you should be prepared.